GROUND CUTTING EDGE 58 February/March 2018 unmanned systems inside However, there are major challenges in using a camera-based approach for under- ground navigation. For example, there are a variety of ways in which the appearance of the underground environment can change, confusing navigation systems. "There can be dust, water, and the lighting can be vari- able—it can be quite dark, or another vehicle can shine light directly onto the sensors," Milford said. Rocks can also fall on sensors, "damaging them or knocking them out of focus," Milford said. "And underground mine tunnels can all look the same, being featureless and uniformly straight, making it very hard for a system to keep track of where it is." 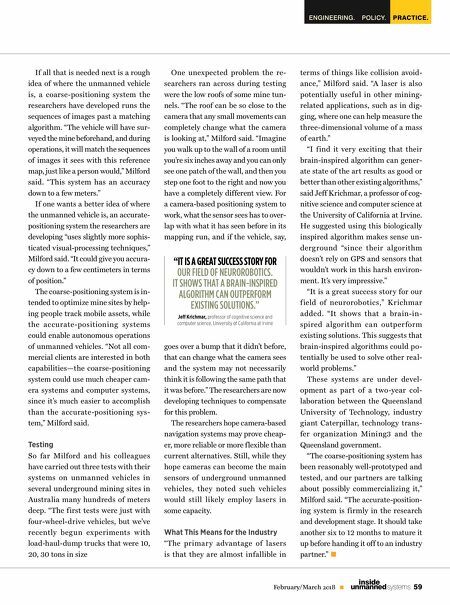 Inspired by Biology To help underground unmanned vehicles navi- gate despite these challenges, Milford and his colleagues relied on more than a decade of research they had conducted on biologically inspired navigation systems. "In the natural world, animals are not walking with $10,000 lasers strapped on their heads to navigate," Milford said. 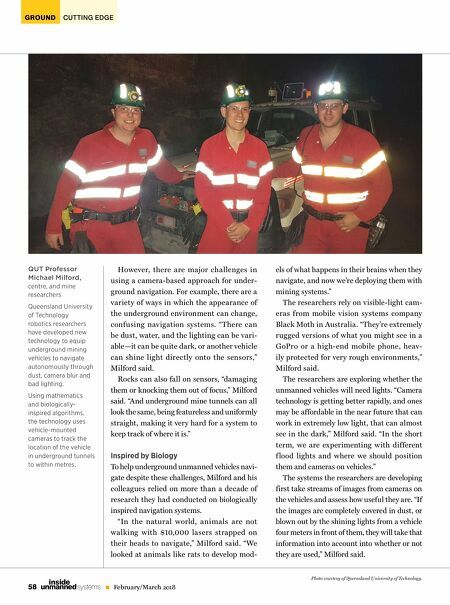 "We looked at animals like rats to develop mod- QUT Professor Michael Milford, centre, and mine researchers Queensland University of Technology robotics researchers have developed new technology to equip underground mining vehicles to navigate autonomously through dust, camera blur and bad lighting. Using mathematics and biologically- inspired algorithms, the technology uses vehicle-mounted cameras to track the location of the vehicle in underground tunnels to within metres. Photo courtesy of Queensland University of Technology. els of what happens in their brains when they navigate, and now we're deploying them with mining systems." The researchers rely on visible-light cam- eras from mobile vision systems company Black Moth in Australia. "They're extremely rugged versions of what you might see in a GoPro or a high-end mobile phone, heav- ily protected for very rough environments," Milford said. The researchers are exploring whether the unmanned vehicles will need lights. "Camera technology is getting better rapidly, and ones may be affordable in the near future that can work in extremely low light, that can almost see in the dark," Milford said. "In the short term, we are experimenting with different f lood lights and where we should position them and cameras on vehicles." The systems the researchers are developing first take streams of images from cameras on the vehicles and assess how useful they are. "If the images are completely covered in dust, or blown out by the shining lights from a vehicle four meters in front of them, they will take that information into account into whether or not they are used," Milford said.